Andrew Haigh is the rare filmmaker that's more interested in presenting viewers with fully-realized characters—who feel like they existed before they came into frame and will continue to do after they leave it—than any sort of high concept or twisting plot. Most writers treat their supporting characters especially like plot devices, only fleshing them out to the degree they impact their protagonist. Not Haigh. In his masterful “Lean on Pete,” we meet a dozen or so people whom we don’t spend much time with, but who feel real. There’s Steve Buscemi’s irascible race horse owner, Chloe Sevigny’s horse rider, Amy Seimetz cooking breakfast, Steve Zahn’s homeless alcoholic, and several others who cross paths with our hero, a boy named Charlie, played with heartfelt, poignant perfection by Charlie Plummer. Again and again, I marveled at the humanist depth of the world Haigh creates, one that can only be rendered by a truly great writer and director, working near the top of his game. The man behind the Oscar-nominated “45 Years” shifts gears to the Pacific Northwest in “Lean on Pete,” where we meet a relatively average kid named Charlie. He’s 15; he runs in the morning; he struggles near poverty with his single father. In the opening scenes, he mentions to his dad’s new love interest (Seimetz) that the reason the cereal is in the fridge is because roaches can get to it more easily in the cabinet. It’s these subtle little exchanges that Haigh so often uses to flesh out his characters without overemphasis. For the most part, it seems like Charlie is a nice, smart teenager. His life changes when he’s running by a horse track one day and encounters the cantankerous Del (Buscemi), who needs help with a flat tire. He offers Charlie $10 to help him out. And then $25 a day to do other random jobs. And that’s when Charlie meets “Lean on Pete,” one of Del’s gorgeous horses. Del exists on the fringe of horse racing, taking the animals to small, two-horse races, and often selling them after they succeed—or, in a dire bit of foreshadowing, “sending them to Mexico” if they don’t. Charlie quickly figures out what that means. In ways I wouldn’t spoil, “Lean on Pete” becomes something of a road movie about a boy and the horse who gives the movie its name. As the film builds momentum, Charlie’s situation becomes increasingly desperate and moving, but never in a way that feels melodramatic. The main reason for that is the incredible trust that Haigh places in Plummer, placing him in the center of almost every scene in the film and asking him to carry it. This is such a subtle, beautiful performance, one that really anchors what could have so easily become manipulative garbage—most coming-of-age stories that place teenagers in jeopardy are—but one quickly feels like they know Charlie. Without monologues or voiceover, we come to understand why Charlie makes the decisions he does. Just as Rampling’s performance in “45 Years” grew in power as she became even more internalized (think about her final scene in the bathroom, where she does more just by looking in a mirror than most actresses can with a monologue), Plummer has a similar arc. He becomes so fully realized that he doesn’t need to explain what he’s doing. We just believe it. Part of the reason for that—and this could be in part due to the fact that I have three young sons—one quickly comes to care for Charlie. When this young man sees a beautiful animal who may not have many races left in him, he responds emotionally. He’s not yet grown too cynical from adulthood to do so. We go with the beauty of this story in the same manner that Charlie falls for that horse—it feels like we don’t have a choice. 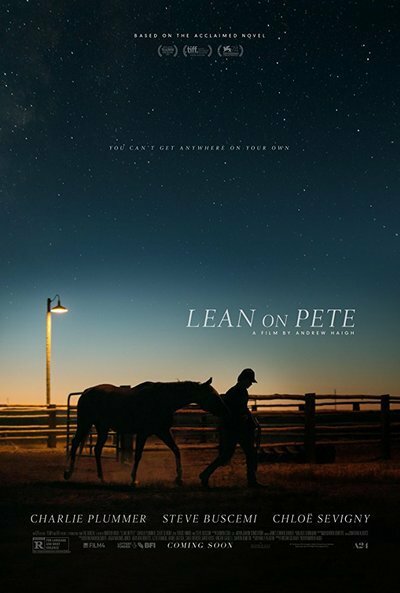 Haigh’s gift for character can sometimes overshadow his technical ability when people write about his work, but there’s a mesmerizing rhythm to “Lean on Pete” that drives the narrative. It’s tempting to call it lyrical, but it’s never quite that underlined. It’s just something in the fabric of his films, the way he gently segues from one encounter on Charlie’s journey to the next without developing that herky-jerky, episodic rhythm that so often defeats “road movies.” Charlie’s plight grows increasingly unnerving, and yet Haigh never goes for the contrived “child in jeopardy” structure or music cues. It’s really the story of someone falling into a dangerous situation because he acts with his heart—he doesn’t know how to do anything else. It sounds clichéd, but you really don’t see a lot of movies like “Lean on Pete” in a calendar year. Even films ostensibly made for an adult audience often come to them with a higher concept than “a boy and horse.” And so I worry that it’s a tough sell for people who are going to consider it either a movie for young audiences or a manipulative melodrama. And that’s something else that should further our appreciation of Haigh. He follows up a movie about an elderly, married couple at a crossroads with that of a journey film about a runaway teen and a horse. At first, it would seem that “45 Years” and “Lean on Pete” have nothing in common, but it’s Haigh's power with the way people interact—how they talk, what they reveal, what they choose to hide—his remarkable trust in his actors and his own storytelling abilities that tie them together. This review was filed from the SXSW Film Festival on March 16, 2018.